As our plane landed in the Bay Area, I tried to figure out how I was going to think about this part of our never-ending trip. On the one hand I wanted to write about my experiences in the U.S. in the same way as I have in other countries we had visited. On the other hand, this was not a new and exciting place. Palo Alto had been our home for more than 40 years— the place where we had raised our children, made life long friends, and was filled with wonderful memories and experiences. The inescapable conclusion was I needed to write about our time in the U.S. from both perspectives — both personally, as someone coming home again after some extraordinary experiences, and as a visitor to a new and exciting land — doing my best to approach F. Scott Fitzgerald’s definition of a first-rate intelligence: “the ability to hold two opposing ideas in mind at the same time and still retain the ability to function”. Yes, some things had changed. The traffic, as we had expected, had gotten worse, and it was hard to get used to the prices — a great meal in Madrid was half the price of a so-so meal in Palo Alto. But even while other things had stayed the same, our experiences allowed us, or more often compelled us, to look at those things differently. There were the dramatic differences in the lifestyles in our last two stops— Spain and Portugal— and Silicon Valley. At times the differences were so great, it almost seemed as if the two places existed in alternative universes. In Spain and Portugal we would sit in cafes, the people around us laughing and talking with friends. In Palo Alto the atmosphere was rife with deal making, and it seemed all business, as they say, 24/7. Southern Europe seems like a great place to live— people working to live. On the other hand, for the ambitious or possessed, Silicon Valley is a better place to make money, if you are willing to put aside most of the rest of your life and live to work. I’m not sure if it is possible to have some of both. One seems to preclude the other, contrary to the hopes and wishful thinking of many, and the sickly sweet aphorisms on Facebook. I remain a bit cynical (but in my heart of hearts hopeful) whether our culture will ever be able to achieve the mythical “work-life” balance everyone seems to be giving lip service to these days — at least in Silicon Valley (and places like New York as well). Not only did our experiences open our minds to different ways of thinking and seeing the world around us, but we had changed as well. It wasn’t just a result of our travels; we were just continuing on a path we started down before we left. When we started thinking about traveling, we realized that not only were we stuck in our daily, weekly, monthly and yearly ruts, but we had become a prisoner of our possessions. We sold our house and cars, gave almost everything else to charity, and put the very few things that meant something to us in storage. Suddenly we felt lighter as we realized we were freed from the tyranny of all of our stuff. Interestingly, younger people we meet on our travels understand that perfectly. They are of a generation where many value experiences over things. We had spent the last fifteen months with each of us living out of a twenty-seven inch suitcase plus carry on, with Linda having only a bit more (and along the way realizing she really didn’t need much of it) — buying almost nothing, not only because we had learned along the way we couldn’t travel the way we wanted to if we had a lot of stuff with us to manage, but because we were quite willing to trade possessions for experiences. We did, of course, buy necessities like food and toiletries, and replace worn out clothes. But even in large cities like Madrid, we preferred small local markets. Early in the trip, those large “local” markets hyped in travel guides had lost their appeal. So maybe you can imagine, or then again maybe not, how overwhelmed we felt the first time we went into a big box store like Costco after fifteen months on the road. Between the availability of things for sale and the size of the store and the constant bombardment in both the store and on TV (which we had happily not watched since we had left) of: “Buy me!”, “You need me to make you happy, better, sexier …. ”, “I’m on sale and stock up on me”, our minimal-stuff happiness was under attack from all sides. I felt myself getting sucked in. But in the nick of time, I donned my traveler’s cloak and battled the forces of consumerism, as I reminded myself that I already had all that I needed, and my suitcase wasn’t getting any bigger, nor did it have a secret compartment that would allow me to store things in another dimension. Although, in the spirit of transparency, I must confess, I did trade in some of my old clothes, which I was ready to burn after wearing for so long and so often, for some new stuff to take on the next leg of our trip. But some things did stay the same —the important things. Although we had met up with some of our friends from the U.S. in various countries as we traveled, fifteen months was way too long not to see our family and friends — we missed them all desperately. Aside from questions about our trip, we continued our conversations as if we hadn’t been away at all. And then, finally, after visits with doctors and dentists, we headed south for the most precious part of our trip — to see our daughter and her husband, our son, and eventually Linda’s mother. But thinking about California as another place to visit on our continual world tour, we treated our trip down the California coast to Los Angeles as another visit to a foreign country. 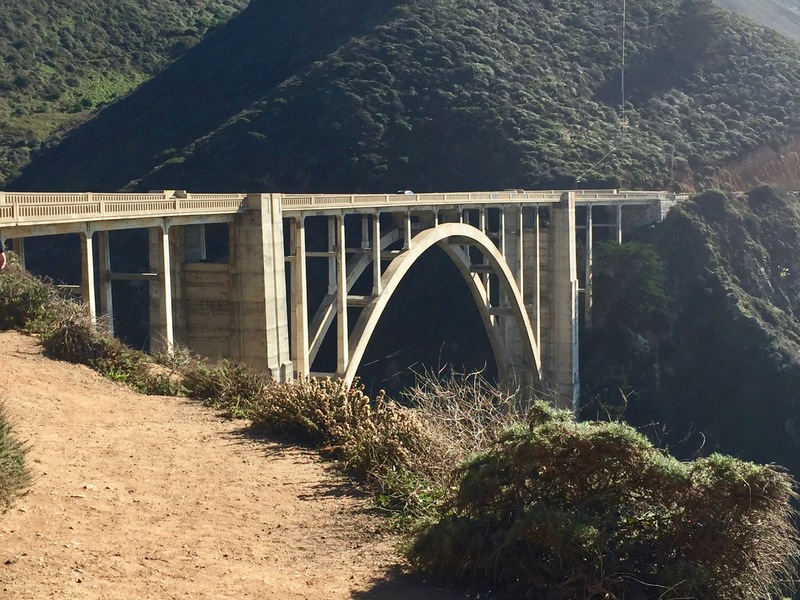 As all of the craziness in the Bay Area evaporated (at least until we reached the craziness of Los Angeles), we got to experience the exquisite beauty of the California coast around Big Sur. While we were traveling, and when we got back, people often asked us what our favorite place was. I had no favorites— to me it was wherever I was at the time (with only a few exceptions), but Linda had fallen in love with New Zealand, and she always did a great job convincing people they needed to go there, sometimes to the amusement of people she didn’t know were from there. 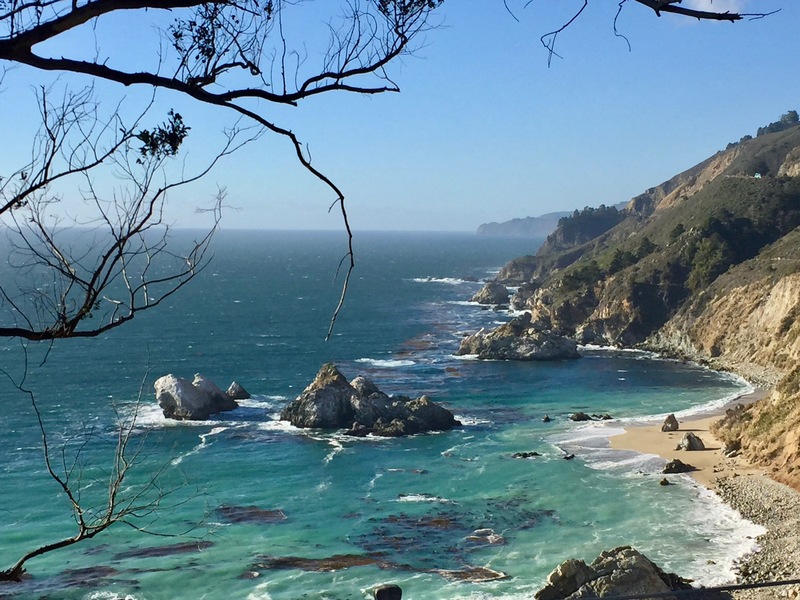 As we drove down the coast listening to 60s rock (all that was missing was a roadster with the top down) and frequently stopping (sometimes every half mile) to wonder at what we saw, we realized that the California coast around Big Sir was as breathtaking as any other place we had visited around the world. In my role as a visitor, we could not have visited the U.S at a better time. We had landed in California ten days before the election, and while we had been following it from abroad, as had many of the other people that we met on our travels, it wasn’t until we got back to the U.S. that we realized the level and intensity of anger and acrimony on both sides. Although we had observed it in other countries we visited, we found ourselves trying to make sense of the ascendency of post-truth politics — appeals to emotion without any connection to the details of policy, or even fact, and where factual rebuttals are dismissed as irrelevant. Fake news, and news as entertainment seemed to have become normative. With the internet and other media as tools, George Orwell’s world of 1984, where history is changed to fit the goals of the day, had become a reality. It appeared to me as an outsider that the U.S. had finally caught up with Russia in the disinformation skills race. But what was chilling in the aftermath of the election was not just the whole transition mess (which would make great reality television if the consequences were not so threatening), but some of the responses to Trump’s election by many on both sides to promote their own agendas. The racist and xenophobic and anti-semitic vermin crawled out from under their individual and collective rocks, and acted as if the election results were carte blanche permission to physically attack those they feared and hated. And then there were mostly self-serving, oversimplified post-election analyses by the pundits that simply explained everything away as racism and an uneducated working class, without paying any attention to the real, and fundamental, issues that face the country. It amazed me when re-elected House minority leader Nancy Pelosi insisted on CBS’s “Face the Nation” that people don’t want a new direction because the Democratic Party’s values are about supporting America’s working families. Taking a longer view, there is one substantially interesting thing that will come out of the Trump Presidency. We finally have an opportunity to see if our country is better off being run as a business by businessmen (and yes they are all men), or that idea can be finally laid to rest. Thanks again for your insight. yes as those of us who are lucky enough to travel realize the Bay Area is a wonderful place to live and if you look at the beauty around us and the weather. Sadly the ‘Silicon Valley crap’ distracts us. We miss having our buddies here! We miss you two as well. See you in may. If you ever decide to run for office, can I be on your team? Absolutely! What position would you like? I was thinking about Secretary of State.